And so Hannukah is over and K’s party is tomorrow. Down came the window clings and hannukiyot, away went the furniture, and up went a couple of tents. I’ve actually been quite productive this week – I culled and organized R’s clothes and decluttered the kitchen counter (although it promptly got re-cluttered). I finally made it to the bulk warehouse and found individually-wrapped chocolate bars, so I was able to sit down and make up little s’mores packets. The cellophane bags were in my Purim box (similar to my Hannukah box, but for Purim stuff) – I think I used them for Mishloach Manot one year. And the label… well, I have to say that sewing is my new favourite way to stick paper together. In this case, the stitching is holding the bag closed as well as attaching the tag. I spent some time today opening up the flashlights to remove the little film that keeps them from sucking their batteries dry while in the package. Then I experimented with the alphabet stickers and found that they were actually a bit tricky to handle without them rolling up and losing their stickiness. If they’re difficult for me I’m willing to bet that the kids will also have trouble with them, so I decided to just label all the flashlights tonight. No pics tonight – you’ll have to check back tomorrow night or Friday for pictures of the party. I can’t honestly say that any of it was my doing, but we all seem to be healthy at the moment (knock wood). Kleenex consumption has seen a 300% reduction since two weeks ago. Hooray! I have the feathers and the bears, but I still need to chop down some ornamental grass from the backyard and buy some mushrooms from the grocery store… and then I have to hide everything in the living room. I went out with the kids and some friends to find pinecones and sticks. Mission accomplished. 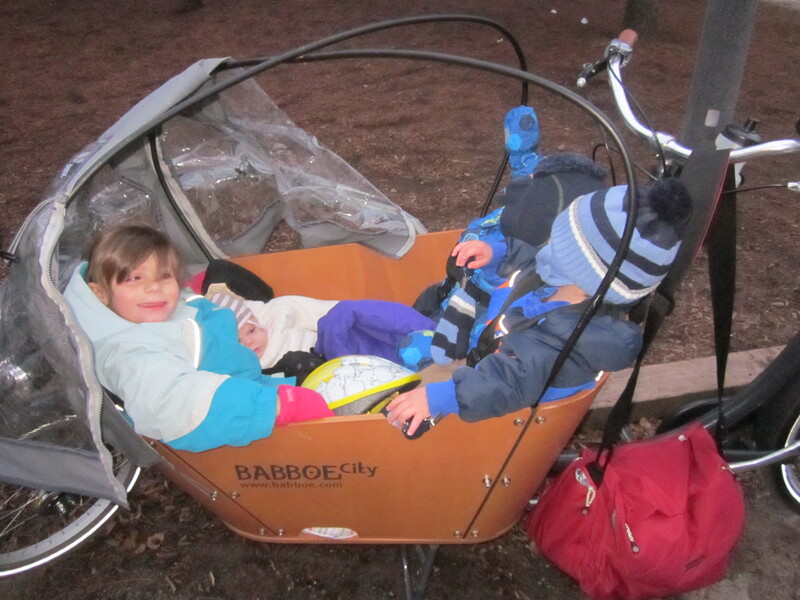 Even better, we went out in the bakfiets – me with FOUR kids in the bike. It was very awesome. Surprisingly, it wasn’t any more difficult to ride with four kids than with two. I love my bakfiets! There are four - count 'em, four - children in the bike. Seriously, this bike is made of awesome! K’s birthday cake is baked, I just need to decorate it. In keeping with the camping theme I’ll be using brown sugar and oreo crumbs as dirt (as long as oreo crumbs are pareve: I’d better check), flake bars as logs around the fire pit, candy rocks for the fire pit, pretzel sticks for the firewood and gummies for the flames. I’m also going to make a tent out of bamboo skewers and fabric. I should probably write something on it, too. I made N an adorable kippah last week (Lisaleh mentioned it on her blog) and K immediately wanted it (of course). I pointed out that I made it specifically for N, but that I’d be happy to make one for her. She keeps asking when that’s going to happen, so I’d better do it this week. I can’t wait to see Pictures of the cake! Good luck with the party! Waah! I don’t want to miss such fun, but at least I have a great picture of your bike to stare at… btw, as I’m sure you know by now, real oreos are dairy; for pareve, you need the “fake-i-o’s” that were all there was in kosher-land until a couple of years ago. Actually, at least in the US, oreos are now dairy-free but still OU-D (equipment). I know this because I am violently allergic to dairy. See here.